It’s not very difficult to choose exactly the right chimney cap for your home, especially if you take it one step at a time. There are just four things to consider: shape, type, metal, and size. First, what shape should your chimney cap be? Look at your chimney and find the flue, the pipe that lets the smoke out. It’s either round, square or rectangular. This is a Rectangular arrangement. OK, now let’s figure out which type of chimney cap you need. Click on any photo to find out more. Now that you know what shape and what type of chimney cap you need, it’s time to consider which metal would be best for your chimney cap. Chimney caps are manufactured from stainless steel, copper, and galvanized steel. Stainless steel is the best value for the dollar. Copper is the most elegant, especially for historic or upscale homes. Stainless steel and copper chimney caps usually come with a lifetime warranty. Some companies can have stainless steel caps coated with black or colored heat resistant coatings. Galvanized steel is the least expensive and the least durable. Galvanized steel chimney caps are usually painted black. Copper is not recommended for light colored chimneys. Stainless steel is the preferred metal for salt water climates. Finally, what size should your chimney cap be? To answer this question you or a contractor will have to get up on the roof and take careful measurements. Be sure to take a pencil and paper, as well as a metal yardstick or metal tape measure. Take a metal square to insure you are measuring with square, 90 degree, corners. If you have a square or rectangular clay flue pipe that sticks up above the chimney crown more than an inch, measure and write down the length and the width of the flue. If you have a round clay flue, measure its outside diameter. If your flue doesn’t stick up at least an inch, or if you have multiple flues, measure each side of the area you want the chimney cap to cover. Start with the longest side and, going clockwise, measure each side of the flue or array of flues. Be sure you are using 90 degree corners. Record your measurements in inches. Now is the time to consider whether you want a chimney cap or if what you really need is a combination damper and chimney cap. We recommend the Lyemance brand of dampers because they save you up to 90 percent of the energy that is lost with a traditional damper. The Lyemance dampers are available in combination with a quality chimney cap. Chimney caps for unusual conditions. Some chimneys whistle or sing in high winds; some don’t draw well when the wind is coming from certain directions; and some don’t draw at all.Please email us to let us know if you need a chimney cap that rotates so that its open side is always down wind. We can arrange that for you.Other chimney caps are made to cure ‘back-puffing’ from down currents caused by mountains or tall buildings. These are available both for round flues and for masonry flues. 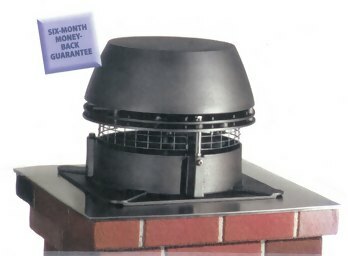 For the most difficult cases, there are chimney caps with integral electric fans that pull the smoke out of the chimney. Likewise, these Exhausto Fans are available for round fluesand for other flues. A special note about metal chimneys for gas fireplaces and woodstoves. Metal chimneys come in three types: just plain pipe, air insulated, and solid pack (also called ‘Class A’ chimneys). Air insulated fl ues have an air jacket surrounding the flue, a pipe within a pipe. Some have a larger third jacket that’s just for appearance. Choose a chimney cap designated for air insulated chimneys, one that fits inside the flue and has a bottom plate large enough to cover the air jacket and decorative jacket, if one is present. Solid pack flues have a flue surrounded by packed insulation and an outer pipe. A third decorative pipe may or may not be present. Choose a chimney cap designated for solid pack chimneys, one that fits inside the flue and has a bottom plate large enough to cover the outer jacket and decorative jacket, if one is present. A special note about custom chimney caps. Sometimes, the chimney cap you want just doesn’t exist as a stock item. “Mesh” refers to the screened area of chimney caps. Many localities–primarily California, but also some other areas around the country–have codes calling for 1/2″ spark arrestors. Some localities call for such spark arrestors in “wooded areas” or “within 200 feet of wooded areas.” According to the National Fire Protection Association, chimney caps with 5/8″ mesh will not allow a 1/2″ sphere through them, and thus are considered the industry standard for California-sized chimney caps. If you live in such an area, local laws may require such specially sized mesh to conform to these spark arrestor codes. We have a wide selection of chimney caps with 5/8″ mesh for round, top mount, outside mount, single and multi-flues. Is there a difference between chimney caps with 3/4″ mesh and chimney caps with 5/8″ mesh? Is it a difference I need to know about before I select a chimney cap? Yes, there is a difference between 3/4″ and 5/8″ mesh chimney caps, and, depending on where you live or other special circumstances, it might be a difference you need to take into account when buying your chimney cap. The “mesh” is the screen part of the chimney cap. It is the section below the “lid” or roof that lets the gases out of your chimney but keeps leaves and birds, insects, and other animals from getting into your home. The two mesh sizes for chimney caps are 3/4″ or 5/8″, with the 3/4″ mesh having slightly larger holes in the screen than the 5/8″ mesh has. The vast majority of American chimney caps have 3/4″ mesh. But many localities  primarily California, but also some in other areas around the country  have building codes that call for chimney caps with “1/2 inch spark arrestors.” Some localities call for such chimney caps in wooded areas or within 200 feet of wooded areas. The purpose of chimney caps with “1/2 inchspark arrestors” is to prevent sparks and burning detritus that are a half inch or larger from escaping from chimney caps and starting wild fires. Since so many of the chimney caps with the smaller, 5/8″ mesh are used in California, chimney caps with the 5/8″ mesh are also often called California-style chimney caps. How will I know if I need a California style, 5/8″ mesh chimney cap? If you are buying a home, ask the realtor. If you already own the home, you can call the local government department that deals with building codes such as the department that issues building permits. You local chimney sweep will also know. Would I ever want California style, 5/8″ mesh chimney caps if my local building codes don’t require them? Yes, some people select chimney caps with 5/8″ mesh even though they are not required by their locality. People who have wooden roofs on their home or outbuildings, those with woods near their homes, and others who live in dry areas that are susceptible to wild fires have chosen to buy chimney caps with 5/8″ mesh to reduce the likelihood that a spark escaping from their chimney cap could start an outside fire. There’s one other reason people might select chimney caps with 5/8″ mesh. If you have an oval flue and want a chimney cap that mounts to the flue instead of to the crown of your chimney, consider a 5/8″ mesh chimney cap. It is not unusual for homes in California, Arizona, Nevada, and Oregon to have oval flues, so some chimney cap manufacturers make 5/8″ mesh chimney caps with a special base that can fit either a rectangular flue or an oval flue. Chimney caps with 5/8″ mesh are manufactured to meet local building codes designed to reduce wild fires. But you might have a special circumstance, such as a roof or exterior environment susceptible to fire, which might lead you to select such a chimney cap even if your local codes do not require 5/8″ mesh chimney caps. your fireplace or chimney has.